Spinal injuries are some of the most severe injury types that people may suffer when they are injured in motor vehicle accidents or in slip-and-fall accidents. When a person suffers such things as fractures to the vertebrae, protruding discs or herniated discs as a result of their accident, they may need to get spinal fusion surgery due to the trauma causing event. Called arthrodesis, spinal fusion surgery is a major procedure that will require the person to stay in the hospital for multiple days so that they can be carefully observed. They may also require post-surgical rehabilitation so their back function can return. There are several different spinal fusion procedures that depend on the location and type of the injury. When people have an injury to the lower area of their back, they may require lumbar spinal fusion, which is performed in the lumbar region of the vertebral column. In this surgery, doctors take donor bone either from the person’s pelvic bone or from another source. That bone is then grafted onto the two bone pieces to fuse them together, and the graft allows new bone to form. 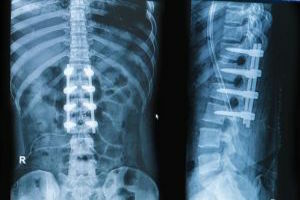 Doctors also place metal in the person’s back to hold everything together while new bone grows. Rehabilitation may be expected to take a significant period of time and the person may need to wear a back brace. While the surgery may provide some relief, there are significant risks involved. Risks include such things as infection, the body’s rejection of the implanted bone, ongoing pain at the site of the bone graft, nerve damage and blood clots. People may also develop arthritis in their lower spinal region after undergoing spinal fusion surgery. In some accidents, people suffer spinal injuries to the cervical region of their vertebral columns, which consist of the bones and discs of their necks. Spinal fusion in this area may be performed in order to stabilize the vertebrae and discs following a different surgery or as its own procedure. With cervical spinal fusion, surgeons take bone from a donor source or from another location in the person’s body, such as the pelvic bone. Sometimes, doctors will choose to use fusion materials made out of artificial substances as well. Like in lumbar spinal fusion, cervical spinal fusion involves the surgeon grafting the bones or discs together with the graft material. The doctor may then use metal plates to stabilize the bones so that the graft remains in place and promotes new bone growth. In some cases, a vertebra will be so damaged that it will be removed and the bones then the graft used to graft the adjacent vertebrae to that bone together. The same is true for a disc that is very damaged. Doctors may remove the disc and then graft the bones on either side of it together. Cervical spinal surgery may be performed in order to stop fractures from injuring the spinal cord itself, which could cause the person to become paralyzed. It may also be used for those whose discs have been herniated or are protruding following their accident. After surgery, people should expect to wear a neck brace for several weeks. The risks associated with cervical spinal surgery are several. People may have risks associated with their condition, age and health. They may face risks from undergoing general anesthesia. They may also suffer blood clots in their deeper veins, excessive bleeding and infection. People may reject their grafts and suffer from ongoing pain in the area from which the bone was taken. Some people also suffer an injury to their spinal cords or nerves during the surgery itself. Cervical spinal fusion by its very nature stiffens the neck. While some people do not suffer a loss in the range of their motion, others do. Over time, people may also develop arthritis in the neck area that causes further pain and problems. The surgical procedure can provide some relief in the near future, however. If spinal fusion is recommended, people may want to request a second opinion and fully discuss both the potential benefits and the risks they might face, given their age, health and diagnosis. It is a major surgery that may be necessary following an injury accident, and it is also a very expensive procedure. People whose injuries resulted from an accident caused by the negligent actions of another may also want to contact a personal injury attorney about recovering damages for their medical expenses and other losses caused by the accident.